New York Fed researchers published new papers on banking over the past few months on the Fed’s blog Liberty Street Economics. The first one, titled Stability of Funding Models: an Analytical Framework, is summarised through two different blog posts (here and here). 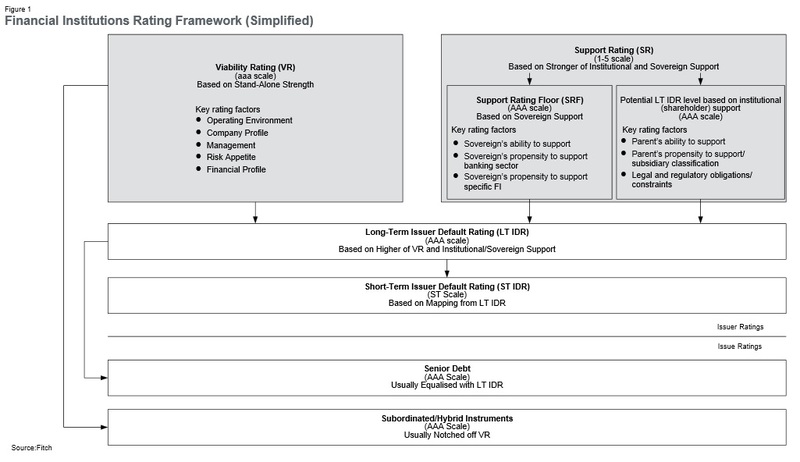 The researchers present a banking model that graphically illustrates the factors that influence the risk of a bank becoming insolvent or illiquid (namely: low asset returns, high leverage, loss of funding (short-term debt maturity profile), asset encumbrance…). Nothing ground breaking. The model simply graphically represents what all banks’ analysts already know. But the principle is interesting. They also published an interactive model you can play with to simulate your own bank (here). I think the internal microeconomic impacts of the firm are also downplayed here: cost efficiency also plays a crucial role, ceteris paribus. 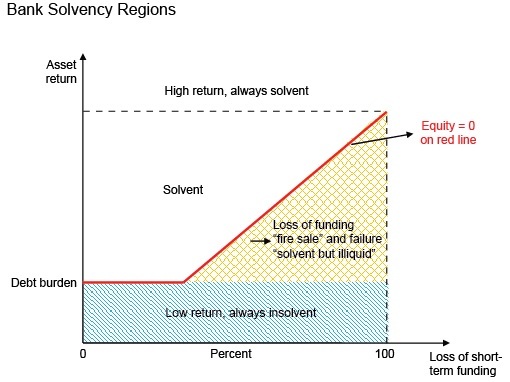 Two banks’ asset returns (and in turn revenues), funding profile (and in turn net interest margin) and leverage could be the same, but the bank with the higher cost/income will have a lot less financial flexibility to absorb the exact same asset impairments when they arise and as a result presents a higher risk of insolvency. The results of our investigation show that a greater likelihood of government support leads to a rise in bank risk-taking. Following an increase in government support, we see a larger volume of bank lending becoming impaired. Further, and in line with this finding, our results show that stronger government support translates into an increase in net charge-offs. Additionally, we find that the effect of government support on impaired loans is stronger for riskier banks than safer ones, as measured by their issuer default ratings. Our findings offer novel evidence that government support does play a role in bank risk-taking incentives. Nothing very surprising here either, but this research adds to the increasingly large literature that underlines the benefits (and the risks) of being a large (and possibly government-linked) bank. Artificially cheaper funding and riskier behaviour pushes the banking system away from its equilibrium state, which is supposed to reflect savers’ intertemporal preferences. This, combined with inaccurate central bank monetary policy and regulatory-distorted interest rates, is a definitive recipe for the misallocation of capital on a massive scale. No surprise financial and economic crises are so recurrent. 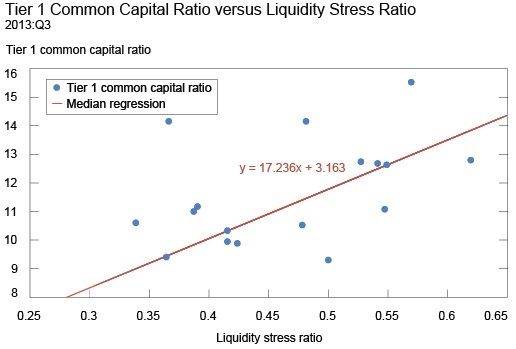 The positive relationship [between capitalisation and liquidity stress ratio] may indicate that when banks are less vulnerable to undercapitalization, they take more liquidity risk. In other words, capital and liquidity may act as substitutes. Really? Take the red line off the chart above and you end up with no clear pattern at all. Some banks play it safe; some others are willing to take on more risk; some are in between. This seems to me to be a clear case of mathematical regression interpretation abuse. Economic linkages between banks give rise to contagion of deposit withdrawals across banks, especially when depositors are aware of these economic linkages. Systemic risk due to the contagion of panic-based deposit withdrawals is thus likely to be more acute for banking systems characterised by clusters of domestic banks which share the same business model (e.g. cajas in Spain or Sparkassen/Volksbanken in Germany). For regulators this accentuates the question of how to monitor and regulate economic linkages between banks stemming from similar exposures, in order to mitigate financial fragility and to encourage greater diversity in the financial system. Are they aware that regulators have been doing the exact opposite of their recommendation for many, many years? Regulations have been trying to harmonise business models since the 1980s, when Basel regulations were first implemented. Moreover, regulators now try to influence banks’ internal organisation and structure to comply with what they see as adequate. The result of all those policies is an increasing lack of diversification between banks. You want more diversity in the financial system? Then tell regulators to back away. PS: Martin Wolf had a piece in the FT this week in which he came on favour of… 100% reserve banking. That’s right. That was a little bit of a surprise to say the least. Izabella Kaminska discussed it here, though she seems again to get mixed up between various terms and definitions, and Frances Coppola had a good article criticising Wolf’s idea (though I don’t entirely agree with everything she says).